And so, a car pulled up, my daughter stepped into it, the driver put her suitcase into the trunk. She was on her way to Penn Station, where she’d catch a train back to Boston. I caught my breath, a bit, as her taxi pulled away. It will be another month before I see her again. She’d been home just six days. Her first night back, she’d done her stand up show at UCB East. The next day, a shoot that is a partnership between Snapchat and Hearst. That night we went to see the Cher play. I would see very little of her for the rest of the week, except for Thanksgiving day, a bitterly cold Thursday, spent with our loved ones. The morning she left for Boston was drama filled; she woke early, felt sick. I made her the usual, toasted bagel with butter, a pair of sunny side up eggs. I forced her to walk Rocky with me, convincing her she needed air. Turns out she just needed to throw up, exorcise the bug creating havoc in her body. Seeing her bent over wrecked me. I remained calm, though, in her presence, brushing her tears as they ran down that beautiful alabaster complexion of hers. She leaned on me as we walked back to the apartment building. She felt better. Whatever it was, was gone. An hour later, we left the apartment, her suitcase in tow, and went to the dog cafe. She was so happy, surrounded by dogs and their owners, her grilled cheese sandwich devoured in moments (by her, of course). It was a roller coaster of a morning, with a sweet hug, and an I love you as we said goodbye. I miss her already. I can’t get enough of Michelle Obama’s book tour. Bridget Everett is a boss. Abortion pills may be no bueno. A little bit on quiche. 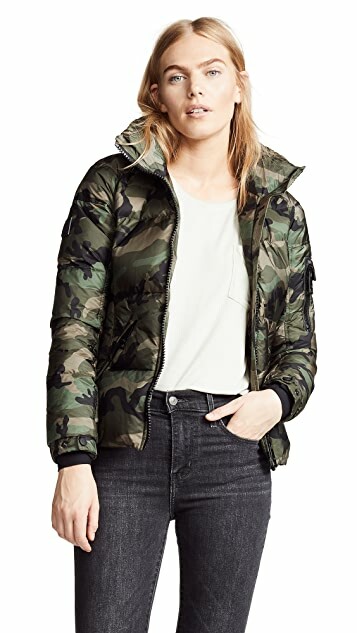 Look at this camp puffer jack from .Sam! Love it! And now have a laugh with Elayne Boosler.